A rollover accident in Portsmouth took the life of one individual and serious injured another. The single-car crash involved an SUV that rolled several times after the driver attempted to regain control of the vehicle. The deadly crash occurred on northbound I-95 in Portsmouth on September 1. Officers were called to the scene around 3:20 p.m. When they arrived, they discovered the driver, Rodney Hoverson, 54, of Harpswell, Maine, has been ejected from the vehicle. Hoverson was not wearing a seatbelt at the time of the accident. Hoverson was taken to Portsmouth Regional Hospital, where he later died of his injuries. A passenger in the car, Darren Carlton, 46, of Vassalboro, Maine, was also taken to the hospital with multiple injuries. According to officials investigating the crash, Carlton was wearing his seatbelt when the accident occurred. Police have told local media Carlton’s injuries were not life-threatening. Officials said the 2003 Mitsubishi Montero was traveling north on I-95 that afternoon, when the vehicle went off the roadway. As Hoverson attempted to regain control of the vehicle, the SUV rolled over a number of times and landed on its roof. The vehicle came to a stop in the southbound breakdown lane. The Montero was the only vehicle involved in the accident, and officials were unsure at this time why the vehicle rolled over. The area of I-95 where the crash occurred was closed for approximately two hours while police investigated the scene. According to a report at Seacoast Online, Hoverson had been warned previously about distracted driving, after crashing a vehicle in Freeport, Maine, in February of this year. After that accident, Hoverson admitted he lost control of the vehicle after getting distracted by the car’s radio. Around 33 percent of all motor vehicle crashes involve rollovers, according to the National Highway Traffic Safety Administration. The administration also states that there are more fatalities in rollover accidents than any other type of crashes today. In fact, more than 10,000 people are killed in these types of motor vehicle accidents every year. 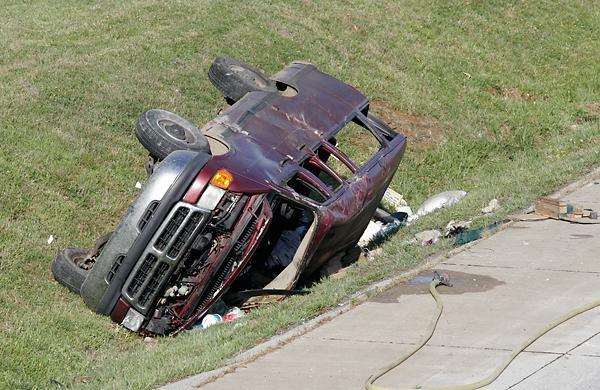 Nearly 85 percent of all rollover accidents involve a single vehicle. Factors that might play a role in these crashes include speed, alcohol and rural roadways. The legal team at Hardy Wolf & Downing would like to warn drivers to use care when navigating the roadways of Maine. If you or a loved one has been injured in a rollover or other type of vehicle collision, a Maine personal injury lawyer from our office can answer your legal questions and help determine if you have grounds for filing a lawsuit. We offer free case evaluations to those who have had their lives upended after a car accident. To learn more about the merits of your case, contact our legal team today at 800.465.8733.